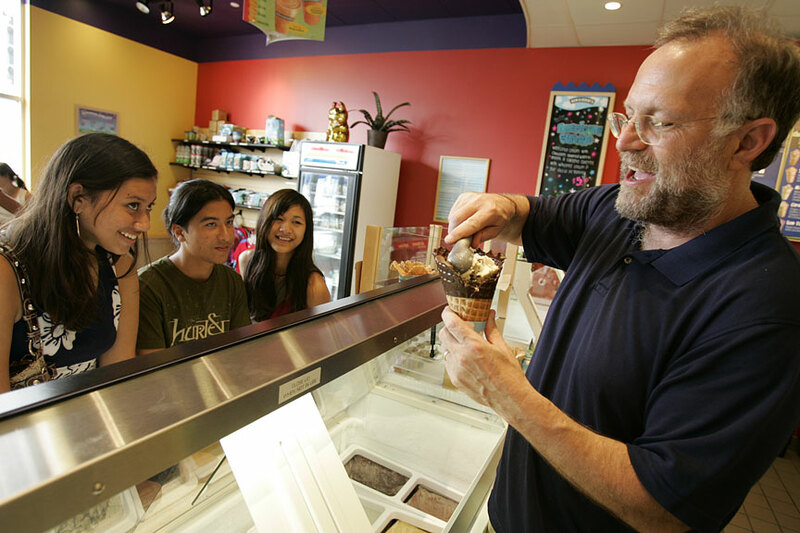 Jerry Greenfield, the Jerry in Ben & Jerry's Ice Cream, was as excited as a kid as he put two scoops on a waffle cone yesterday afternoon. Greenfield, 56, was in town to visit the company's first Hawaii franchise, which celebrates its one-year anniversary on June 30. "They're all very different," Greenfield said of every shop. "I relate much better to the shop owners than the corporate heads ... It reminds me of how we were behind the counter, scooping ice cream." He said franchise owners Ronni Tai See and Robert Yackley have done a very good job, so far, in running the company's U.S. shop farthest southwest of Vermont. He nicknamed them "Ben & Jerry II." Under the franchise agreement, the pair will eventually open a total of four to five shops in the next four years. They are currently negotiating new locations, but for now are more focused on making the first store at Ward Centre a success. The business is building its brand name, slowly but surely, through special events and community involvement, she said, rather than advertising. That means being at the state fair, or holding a fundraiser for the Hawaii Food Bank. This is in keeping with the Ben & Jerry philosophy, which touts itself as a socially responsible business. With Greenfield in town, Ben & Jerry's was offering a happy hour -- ice cream for $1 between 5 to 7 p.m. Usually, a single scoop costs $3.29 and double scoop $3.99. Part of the challenge of getting the business of the ground is that Ben & Jerry's is not yet a household name in Hawaii as it is on the mainland. "We're working on it," said Yackley. While the No. 1 flavor in most shops is Cherry Garcia, a play on the late Grateful Dead singer, the No. 1 flavor in Hawaii, thus far, is the Chocolate Chip Cookie Dough. New flavors this summer include lemon meringue, cinnamon bun and creme brulée. All of the ice cream is made in and shipped from Vermont. In 1978, Greenfield and his high school buddy Ben Cohen opened the first Ben & Jerry's in an old gas station in Vermont. The small shop drew attention for its rich ice cream, with creative flavors, and chunky fruits and nuts and quickly caught on, expanding across the U.S. In 2000, the company was acquired by Unilever PLC, but according to Greenfield, Ben & Jerry's still maintains control over product development and marketing. The Vermont-based company has more than 580 franchised ice cream scoop shops and PartnerShops worldwide.